Swing by BAR JOLIE for pre-show bites and beverages, then stay after for cocktails and the best between-bridges view to be had in Brooklyn. 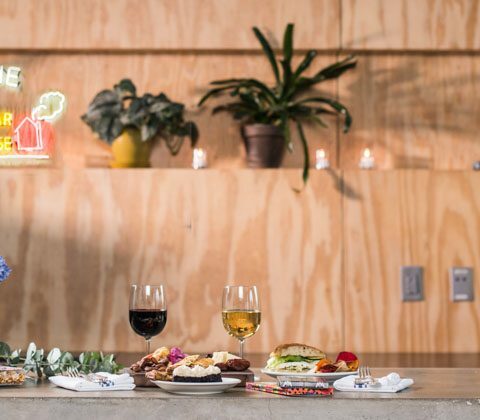 Fresh local fare, craft beers and premium wines are curated by neighborhood favorite, Vinegar Hill House. There are a number of other drinking establishments and places to dine within walking distance of St. Ann’s Warehouse at 45 Water Street. For even more listings and things to do, check out dumbo.is. If you are looking to enjoy a delicious meal before or after the show, St. Ann’s highly recommends Vinegar Hill House. VHH Foods is an all day cafe by Vinegar Hill House located in the Brooklyn Bridge Park waterfront. With waterfront views of the Manhattan Skyline, Cecconi’s Dumbo is a modern day classic Italian restaurant open for lunch, cicchetti, and dinner, as well as weekend brunch. Authentic seasonal Mexican restaurant known for their fresh hand-pressed tortillas, delicious margaritas and extensive tequila and mezcal list. Cozy and rustic space with a gorgeous garden in the warmer months. A Eastern Mediterranean restaurant located on the DUMBO waterfront, just under the Manhattan Bridge. Their kitchen, led by Executive Chef Garett McMahan, serves seasonal, soulful fare that draws inspiration from Northern Africa, the Mediterranean coastline, and the Middle East. Renowned waterfront restaurant known for its breathtaking view of lower Manhattan, fresh ingredients, and exquisite décor. A New York-style pizza emporium. Legendary coal-fired brick-oven pizza – Zagat’s “Best in New York” — under the Brooklyn Bridge. Traditional sushi for dine-in or take-out. Timeless Italian staples include their Margherita pizza and Grandmother’s meatballs. Atrium offers a fresh, market-driven menu that draws influence from Chef Laurent Kalkotour’s upbringing in the South of France. Seasonal Mediterranean cuisine, organic meats, and fresh seafood. Full bar with occasional live music and pool table. Delicious panini sandwiches, salads, and coffee. Full bar and Italian dinner menu. American Industrial Drinking Establishment with a variety of beers, wine, and cocktails. Offers made-to-order pizza, sandwiches, and salads.